The family sedan market is a crowded one. It seems there are endless options when shopping for a new, midsized car, all of them seemingly adequate to cart your family around. One of the mainstays in the competition is the Toyota Camry. I had never had the opportunity to drive the Camry, or any other Toyota car for that matter, and was excited when I heard one would be dropped off at our home for the week. When I came home from work and saw it sitting in the driveway, I was impressed with its sporty, modern look. The 2017 Toyota Camry is available in four different trim levels: the LE, SE, XSE and XLE. 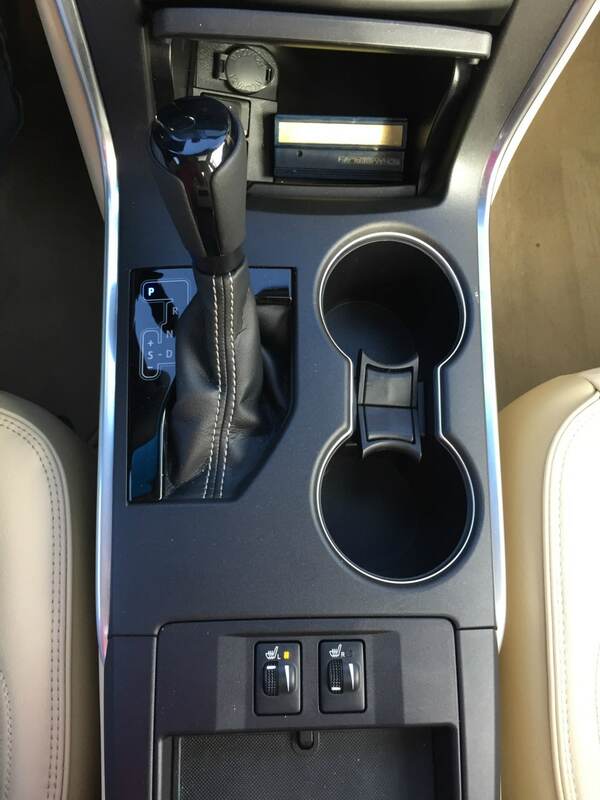 We were fortunate enough to have the more luxurious XLE trim option. All four trims come standard with the 2.5L four-cylinder engine. It packs about 178 horsepower and seems adequate for most of your needs around town. The top two trim levels (XSE and XLE) come with the option of a more powerful, 3.5 liter V6 engine that boosts you up to 268 horsepower. We were provided with the standard, four-cylinder option. I opened the door to check out the interior and was pretty impressed. The 2017 Toyota Camry provides top of the line options at all trim levels. But our XLE came decked out with all sorts of features such as the 7” Touch-Screen with the backup camera and navigation system. I loved the heated sporty front seats with endless options for adjustable comfort for the driver and the passenger. The leather-trimmed steering wheel was comfortable with mounted controls for the audio/entertainment system and Bluetooth controls for your mobile phone. I was also pleased with the TFT Multi-Information Display. This easy to read, the customizable color screen shows all sorts of valuable information like incoming calls, turn-by-turn navigation, and fuel economy. It is also important to note that the 2017 Toyota Camry offers a wireless charging pad for your phone. This is a fantastic idea that I wish my everyday car had. There are also plenty of options for powering your electronic devices (2 12 V power outlets, one USB port and one AUX jack). The interior seemed roomy enough and the back seats had a good amount of leg room. While neither my wife or I are large people, the ultimate test for the interior space of a car for us is installing my daughter’s car seat. I have been dismayed at how tight a fit it has been in some of the vehicles we have used. 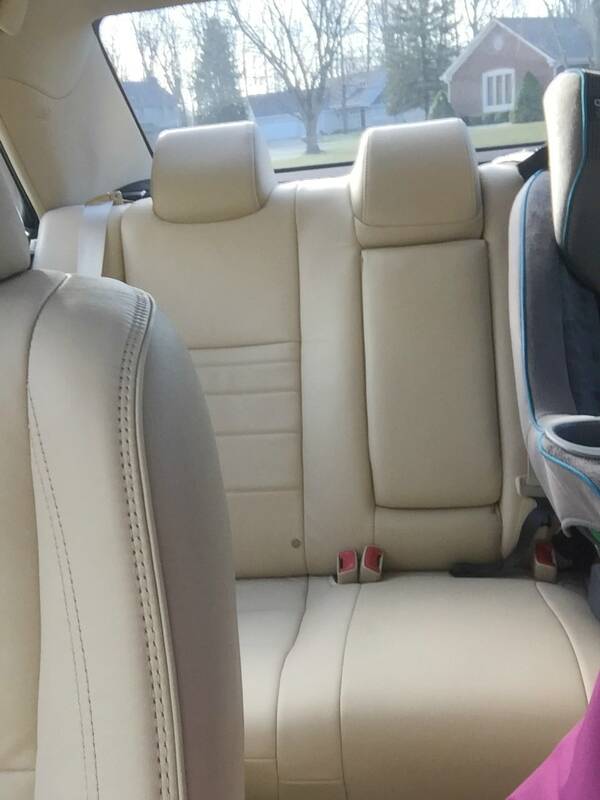 But we were able to fit her seat into the back of the 2017 Toyota Camry with plenty of room to spare. It was time to take our new car out on the road to see what it could do. So I drove it to the gym. The 4-cylinder engine seemed to have plenty of power for me, but understand I am not a sports car enthusiast. In fact, I have never owned a car with as V6 engine. So the engine in the Camry seemed perfectly adequate for my tastes. 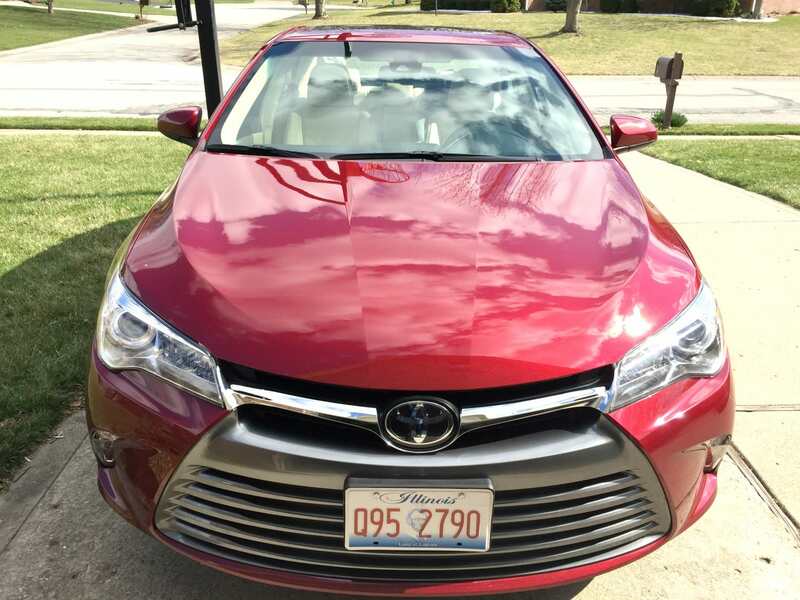 I have heard that the V6 that is optional with the 2017 Toyota Camry makes for an exhilarating drive, but the price difference just wouldn’t be worth it for this Midwestern dad. 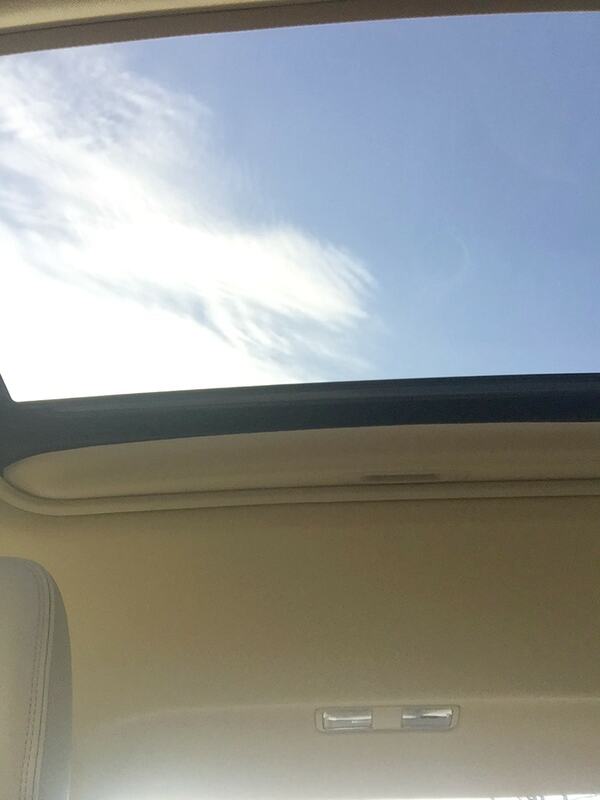 I loved the powered moon roof up top to let in some fresh, springtime air. The navigation system was intuitive and easy to read. The ride to the gym was smooth and quiet. The Camry handled nice, tight and confidently. The XLE comes with some extra safety features such as the Blind Spot Monitor with Rear Cross Traffic Alert. I really appreciated the Rear Cross Traffic Alert in the parking lots backing up. I know we have all been trying to back out of a parking space in a crowded lot and were sure if there were any cars or pedestrians coming our way as we reversed. This system warns you when this is happening and will surely prevent many fender-benders in the future. 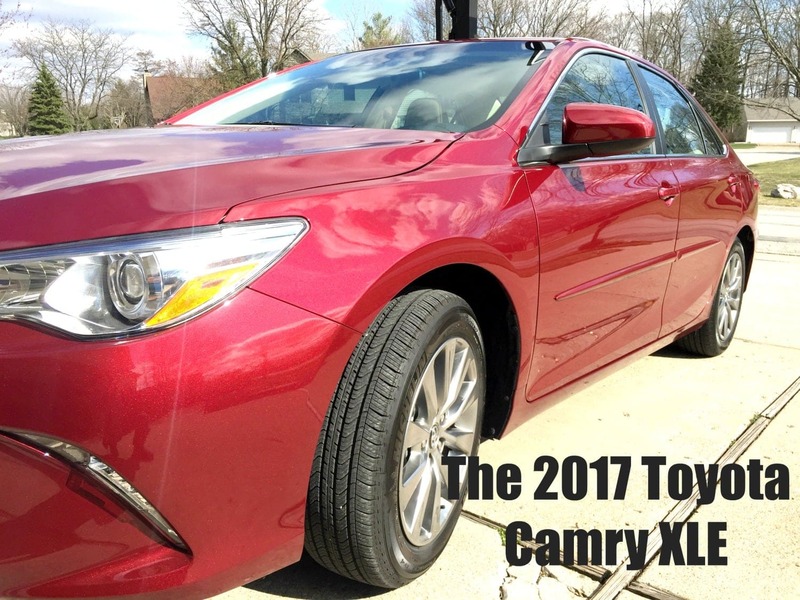 Our week with 2017 Toyota Camry XLE was a satisfying experience with a midsized sedan that is fun and safe to drive and had lots of extras to play around with. My favorite aspects of this car were the safety features, the 7” screen and the sporty, comfortable seats. While there are many options to choose from in this particular market of a vehicle, make sure you head to your Toyota dealership to check out the 2017 Camry before you make your final decision.